Pierre Frot is a graduate from the French "Grande Ecole" for Space and Aerospace (Sup'Aéro) in Toulouse and holds a MBA degree from INSEAD in Fontainebleau. He is also a certified coach, systemic coach and intercultural coach. Prior to joining Herrmann&Associates in 2001, Pierre worked five years in the Paris and Munich offices of the Boston Consulting Group. He then joined CSC Index as a principal in 1994. 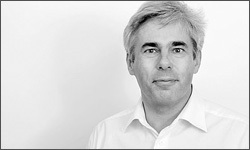 In 1998 he was appointed managing director of CSC Index Germany, supervising 30 consultants. In addition to his consulting experience, he worked several years as an IT specialist for Cap Gemini. Pierre's experiences are centred on helping clients to redesign their business model and processes. Pierre focuses on challenging organizational projects - he has worked in the last years on many merger projects - using innovative, team-based approaches. He understands the requirements of implementing ambitious strategies through holistic consideration of structures, processes, technology and cultural issues. Pierre also acts as an executive and team coach in a number of companies. Pierre's clients so far have included EnBW, Merck KGaA, BMW, EADS, Airbus, Eurocopter, Nokia, Munich Re, Air Liquide.